I have never been a fan of Katie Couric, particularly. 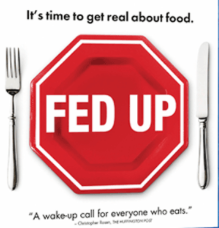 But last night my husband and I saw her film,“Fed Up.” and appreciated how she is bringing to light childhood obesity. While everything I heard in the movie I already know, it was still great to hear it again. The plot of this documentary is the pure evil perpetrated on us by big food companies. Their mission is to make money for stockholders and they do it at the expense of our health. They push products out into the marketplace that are unhealthy but earn their shareholders megabucks. Featured in the film are the experts who have for decades alerted us to this situation includingGary Taubes, Dr. Robert Lustig, David Kessler and many others. The devil is sugar. We eat it by the bucketful and it is hiding in practically everything we eat. While we know it in its natural form of table sugar, it’s also in bread, pasta, rice and hidden in foods like ketchup, yogurt, spaghetti sauce, Hot Pockets, Pop-Tarts, waffles and on and on, well, it’s just about everywhere, including the majority of our processed, refined food products. It’s truly a travesty and tragedy that the American government has sold itself out to the food lobbyists. How short-sighted is it that we allow people to eat foods that down the road will cost their health and their lives. And we will all be paying for their healthcare. The obesity rate has risen in parallel with the removal of fat from our food when we once thought fat was the culprit for obesity. But, you know, it is not. And, as everyone would like you to believe, “a calorie is a calorie,” it is not. Different foods work differently in our bodies. The biggest take away is unused sugar turns directly into fat in your body. A calorie in is not a calorie out. Start eating healthy fats and stop eating refined, processed food-like substances as Michael Pollan will tell you. The real tragedy is when you see what it is doing to our young people. When I went to school lunch in the cafeteria was homemade meals and my favorite, tuna fish sandwiches. Today, kids at school get 80% of their lunchtime food from fast food franchises – Pizza Hut, Taco Bell, McDonalds …they are truly up against it to find a healthy meal. Shame on the American government. Food manufacturers know the earlier they hook a child on their food, they will form a lifelong customer. Thus, TV commercials and characters like Ronald McDonald are marketed to kids. It is criminal what we allow food manufacturers to do and put in the marketplace. It is simply immoral. It is costing all our health. To live healthy in America you have to be extremely vigilant. If you’re lucky enough to have an independent theater in your community, see the film. Then make a pledge to eat healthy – real foods. Stuff that doesn’t come from fast food restaurants or out of bags or cans. It’s not more expensive to buy a whole chicken and some vegetables to cook for dinner, than fast food chains would like you to believe. I’ve said it before: food is medicine. Eat healthy, feed your family healthy, real food and let’s not let the big food companies steal our health. This is our generation’s battle just as tobacco was the battle before us.